After spending twelve years in the construction industry, Tom realised he had a strong passion for hospitality and secured his porter role at The Greenbank Hotel after working in a few local hotels. Believing his biggest strength is his people skills, Tom enjoys helping guests to ensure they have the most enjoyable experience. As well as this, Tom is inspired by all things sports – with his heroes being Brazilian footballer Ronaldinho and darts player Eric Bristow – you can often see Tom gathering the Greenbank teams together for a friendly football game or two. 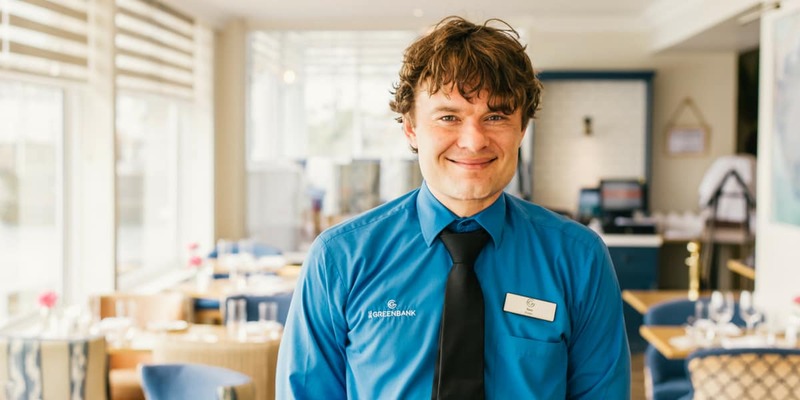 Working at The Greenbank Hotel for just over two years, Tom feels like the team is just one big family and hopes to work at the hotel for many years to come. In the winter, there is nothing I like more than going home to relax and play a few games on the playstation. But, in the summer when the weather is just so hot, I love going to the beach. What Cornish delicacy is your favourite? I’ve got to go for the traditional steak pasty – you just can’t beat them! Can you sum up Cornwall in 5 words? That’s a tricky one! But I would choose: chilled, unique, vibrant, picturesque and home. What is your favourite thing about Falmouth? My favourite thing about Falmouth is the lifestyle – it’s incredibly laid back and the town always has a very relaxed atmosphere for everyone to enjoy.